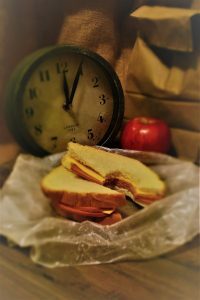 Photographer’s Note: With a vivid sense of time felt throughout this poem, the clock represents a short respite from the otherwise long, mundane hours spent on the finishing line. The baloney sandwich and waxed paper was used for obvious reasons. It also represents “a bunch of baloney” Milt feels he is forced to endure each and every monotonous day at work.